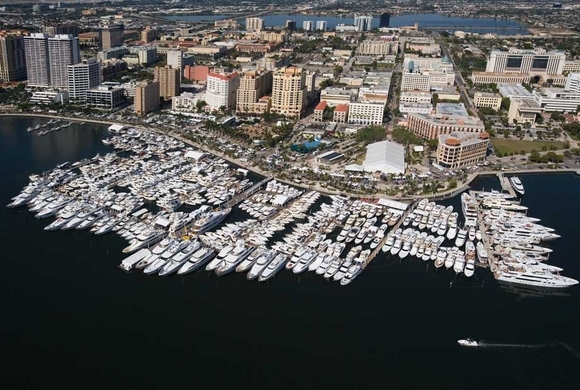 We are proud to be the owners of the Palm Beach International Boat Show, which has grown to become the third largest boat show in the State, and one of the top ten shows in the world. The first-ever Palm Beach International Boat Show was held March 12 – 17, 1982 at Soverel Marine Harbor in Palm Beach Gardens. In 1982, the world for marine business owners was one where their work was considered more of a ‘hobby business,’ rather than being part of a real industry. It’s only fitting that the first boat show was a straightforward attempt by a small group of boat dealers to show their product to fellow hobbyists with minimal fanfare. The same group eventually succeeded in creating an annual event out of nothing. It was clear that a new and improved boat show was necessary to boost the area industry and tourism, but the big question back then was, quite simply, where was the best place to hold the annual event? We tried the Jai Lai Fronton, outside, but being in a sandy field alongside 45th Street was very dirty. A move inside to the Palm Beach Auditorium was followed by shows at the South Florida Fairgrounds, and eventually Riviera Beach Marina. The ability to display boats in the water and in an adjoining park made the Show’s home at Riviera Beach Marina desirable until the memorable and pivotal Year of the Storm in the late 80’s. In 1990, the show was canceled because of an economic recession, a new thing called the luxury tax, and lack of interest and support in a down economy. In 1995, the Marine Industries Association of Palm Beach County, Inc. signed over the production and management of the Show. The result: the first boat show produced by Show Management to be profitable in its first year. The first Show on Flagler Drive wildly exceeded everyone’s expectations!